Wallgarden DIY vertical garden is so easy to install, anyone can do it. With supplies available from any hardware, a drill & a screwdriver, you'll have your green wall or edible wall garden set up in no time. That's right, there's no expensive, specialised clips or bags, saving you money! It's So Easy to Create your Own Vertical Garden! 1. Use treated wood (or paint) approx. 20mm thick and from 38 to 66mm wide. 2. Use appropriate fixtures to securely fix wood upright to a load bearing wall or fence. 3. Attach wallgarden to uprights using 8 gauge screws, position using keyholes on each unit. 4. Position modules at least 20mm apart; increase for taller plant varieties. 5. Bury root ball in wallgarden module using high nutrient potting mix as you would normally. 6. Move completed module into place. 5 Wallgarden modules cover 1 square metre of wall, that's 2 square metres of vertical garden per box! 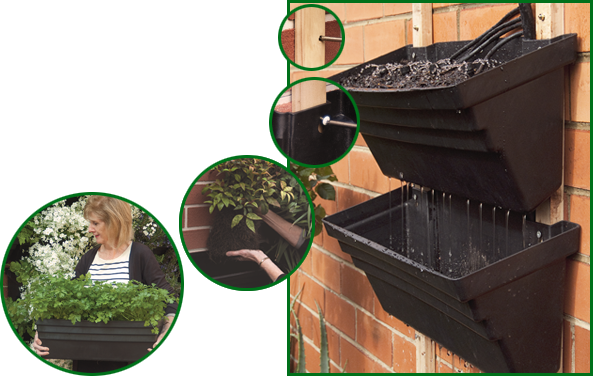 Wallgarden is designed for use with standard irrigation parts. 13mm poly fits perfectly behind the green wall thanks to its specially designed recess so you can run drippers which drain all the way from the top module to the bottom.